The latest parent newsletter and school (parent) council minutes are now available for download. All graduating students are invited to submit their personal write-up and picture collage for the yearbook (the Etobian). Please go to Etobian.com for more information. If for some reason you can't log on, talk to Casey or Klaudia from yearbook. The final date to submit your write-up and collage is Friday, March 24th, 2006. Don't leave it to the last minute! There is a meeting tomorrow at lunch in the auditorium for students attending this year's grad trip to Cancun. YOU MUST ATTEND AS TICKETS WILL BE HANDED OUT. YOU CANNOT SEND A FRIEND TO GET THE TICKETS. YOU ARE REQUIRED TO SIGN TO RECEIVE YOUR TICKETS. All swimmers who are going to OFSSA tomorrow or Wednesday need to check the swim board to see which days your events are scheduled for. If you are not sure, see Miss Ho ASAP. Swimmers must be at the Olympium at 7:45 a.m. each day. Don't forget your $2 entry fee. There will be a pizza lunch for the Senior Girls' Volleyball team on Wednesday in Room 156. Please bring your uniforma and $10 athletic fee. If you are interested in watching and learning more about short films, or if you are interested in a career in film, come to the First Cuts Youth Film and Video Tour in our auditorium this Thursday, March 9th. Admission is free. See the orange flyers posted around the school for details. The TDSB and The University of Toronto are giving students an opportunity to earn co-op credits while working with university professors and senior university students in areas such as Medicine, Social Work, Health Professions, Law, Science, Engineering, Math, and Education. This will be in the summer from July 4 to August 11. If you are interested, see your counsellor as soon as possible. Today is the last day to vote on the grad survey. Don't miss out. Pitchers and catchers must meet tonight at 3:25 p.m. for a 1/2 hour throwing session. The NBA Live Tournament continues next week with semifinals on Monday/Tuesday. Check the SAC door for your playing times. The finals will be after the break and will be held in the auditorium. If you did not hand in your Option Sheet on Monday, please hand it in to Students Services ASAP to be entered today. There will be senior soccer games today and Monday in the main gym. All members of the Badminton Team have practices on Monday and Tuesday after school next week. Your first competition will be held at ECI on Wednesday. The White Pine Grade 9 Assembly originally scheduled for Monday has been cancelled. Listen to announcements for further White Pine information. There wil be a Charlie and the Chocolate Factory rehearsal for the Oompa Loompas today after school. New store lists have been posted on the fashion board. On Monday after school, there will be a practice for all models in the French Connection and Old Navy scenes. There will be an Intermediate Concert Band rehearsal today after school. There will be a Girls' Hockey game today at 3:30 at Lambton Arena. Dismissal is at 2:30. All models in the fashion show should check the board for small changes to the lists. Due to Survivor Week the Triple Trio meeting will be Thursday after school in Room 155 or the auditorium--check both. The annual yearbook grad survey is now back online. To fill it out, go to Etobian.com. If for some reason you can't log on, talk to Casey or Klaudia from yearbook. If you have already voted, you must re-vote. There have been many new questions added to the survey to satisfy student's requests. The final day to vote is Friday, March 3rd, 2006. Also, keep listening to announcements for info regarding the collages and write-ups or check the yearbook board (black board next to the math office) for any updates. The first girls' badminton tryout will be held Wednesday morning at 8:00 a.m. sharp in the double gym. Please pick up a "Permission To Try Out" form from the Phys Ed office. Brentwood Library is offering the Toastmasters Junior Leadership Course on Saturdays from April 1 to May 27. The course will teach public speaking, listening skills, and management techniques. There is no charge for students who are aged 13-17, but space is limited. There will be a dance Friday night in the caffeteria. Tickets are $3.00 and are for sale during lunch time. Today is the official kickoff of Survivor Week! 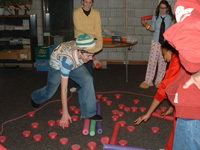 The opening event is none other than the obstacle course. All participants should come to the gym at the beginning of lunch. Spectators are welcome in the balcony, but there is a NO FOOD policy in effect.